A few weeks ago I posted about a fun experiment I did that resulted in the painting, Transitive. In short, I cleaned my palette knife by smearing it all over a canvas creating a chaotic mess which I then finished out by incorporating a mask into the chaos. In a similar vein, I experimented with a second piece a week later, titled I Heard the News, but did not write about its process because of the emotional context unintentionally vested into the piece. The abstract qualities of the background on which the mask is painted did not show through as much in that one, but I was still fairly pleased with the result. So, I decided to try another. For this one I wanted to make sure that the mask would seem to be one with the chaos instead of just painted on top of it. 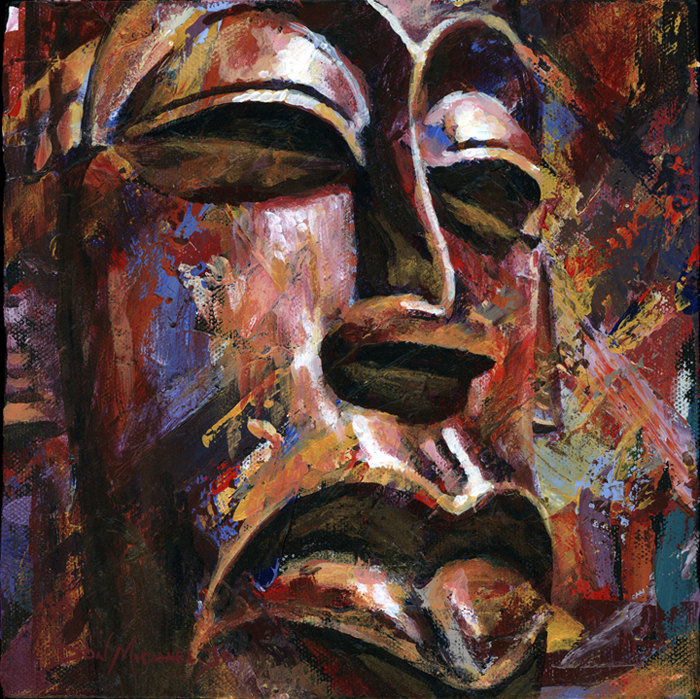 I took down a mask from Ghana (I have no other details about this mask – I believe it is a mass produced “tourist” piece – but it’s still cool), threw some strong light on it to give me some good light/dark reference points, and then cropped in really tight on its face. Using Burgundy (a blend of Burnt Umber and Naphthol Red), Payne’s Grey, Iridescent Brilliant Gold, and Titanium White I started bringing the mask out of the chaos. I was careful to keep the background’s original colors, strokes and textures as visible as possible, but found that I needed to add subtle washes to tone some of them down. This is a series that’s worthy of further exploration!! You’ve really hit on something, and there’s so much for the viewer to ponder. Your underlying palette knife smearings take on an almost cubist quality. Whether or not it was intentional, there are obvious geometrical shapes that interact as planes. This very subtle cubist quality is imparted to the mask in a most interesting way! Furthermore, you incorporated the features of the mask so skillfully into the background (the glazes were a good idea) that the piece is unified and pleasing. There’s a quiet strength to it. Another thing I like is the way the strong horizontal and vertical features of the mask dominate the diagonal strokes of the background. This is a delicate balance, but you achieved dominance so the painting reads as a single thought. I can envision this method imposed on a much larger piece with many more elements. The “Year of the Don” gallops forward! This painting is fantastic. I can imagine seeing these in a gallery and tracking colors from one painting to another–exciting. WOW! WOW! WOW!!!! I really love this Don! The color is so rich and has so much depth. The texture is to die for. Sorry I can’t be more constructive, I”ll just have to sit here in the bleachers and clap and whistle! It’s a good idea. I thought I’d say though that without the title and explanation I wouldn’t have been able to work out what it was about. As the other people have said it is very well painted. Yes, I agree with Kathy. This is a series that deserves further exploration. Order out of chaos; nice! This diametric process has all sorts of possibilities. You know me, I’m a contrast freak in all of its glorious forms. Wow, Kathy! Thank you for honoring me with such a rich critique. You picked up on several aspects I was going for – especially the verticals and horizontals contrasting the diagonals. I’m glad it worked. We’ll see about that larger version… for now I plan to just use 8″x8″ canvasses for this series to keep it consistent. Hallie… Thank you! Getting a few of these done and hanging together will be fun. I like your idea of tracking them via their color palettes. Tonya… Thank you for such an enthusiastic “thumbs up”! It means a lot to me. I wish you could really see the texture, the scan really doesn’t do it justice. Mark… Thank you. I’ve always felt my titles are an integral part of each painting – I’m glad it helped you find what this piece was about… Right now this series is mostly about the fun challenge of responding to the chaos and trying to create some kind of order within it. Stan… Thank you! Diametric process is a cool description. Hmmm… between you and Sue I may have an interesting title for the series coming along. You are on to something big here, Don! Ain’t it amazing where fun can lead to?!! Your blog is inspiring, my friend! Thank you, Dean. I’m glad you find inspiration in my work and words. If it ain’t fun, why do it? Hi Ruth… Welcome to my blog. Thanks for the great comment. I’d love to see what you come up with when you give your project “another go”.